I had lunch with a friend of mine. I don’t quite remember how we came to talk about it but we’re talking about how much you would pay for this or that, and what you would buy if money were no object. Are you familiar with the expression “money is no object”? When you say “money is no object”, it means you’re not concerned about the price of things: you can spend as much as money as you want to on something. For example, when it comes to my daughter’s education, money is no object. Show me your finest car. 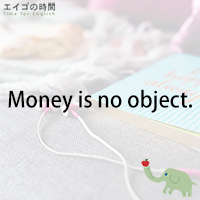 Money is no object. I want the best. Money is no object. I think you should be careful when using this phrase because it could sound “I have an obnoxious amount of money”. In fact, the Urban Dictionary defines it as what rich people say to make it very clear that they are rich.